3M™ Paper Masking Tape 2209 has a crepe paper backing for conformability that will maintain integrity when formed around a corner. Is an economical tape for general purpose applications. Ideal for hand tearable and sliver resistance with one piece removal to help reduce labor. Has controlled unwind for ease of use and reduced waste. Designed for indoor use only as it should not be subjected to outdoor exposure.Typical physical and performance characteristics include: thickness: 4.5 mils, adhesion to steel: 26 oz./in. width, tensile strength: 20 lbs./in. width, elongation at break: 10.5%, temperature use range: Up to 150°F. Tan. Crepe paper backing for conformability that will maintain integrity when formed around a corner. 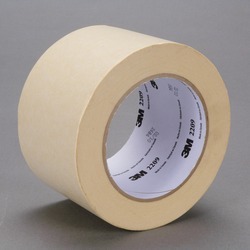 Economical tape for general purpose applications. Sliver resistance with one piece removal to help reduce labor. Controlled unwind for ease of use and reduced waste. Designed for indoor use only as it should not be subjected to outdoor exposure orprolonged periods of sunlight as tape may become very difficult to remove.